For business owners who wish to increase work productivity, office optimisation is the answer. According to Bobby Goodman of the Forbes Chicago Business Council, employees work more efficiently and effectively when their office space is optimised as it is able to accommodate their work flow better. While office optimisation can involve extensive renovations, making minor rearrangements to create more space is a good way to start. This is especially true for small to medium-sized enterprises (SMEs) as they usually work in smaller office spaces. By simply replacing bulky furniture with space-saving multifunctional furniture and rearranging office equipment in your current layout, you are able to create more floor space that can be used for collaborative purposes. Getting the most out of your office space is a bit of a challenge, especially when there are a lot of options to choose from. While some opt to convert cubicles into modular workstations or apply an open floor plan, there is always the possibility that these options are disadvantageous to productivity. 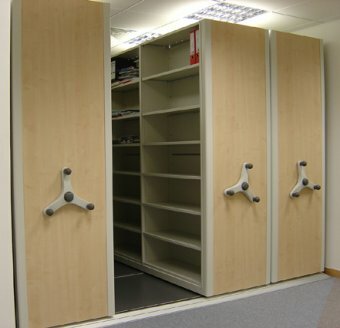 The most basic change you can do to maximise your office’s floor space is to change your storage system. However, this can prove to be difficult when your business has plenty of archival material and other filing needs. Finding the right solution for these involve criteria such as storage capacity, accessibility, security, adjustability, and versatility. Most traditional storage options like filing cabinets and stationary shelving use up large amounts of space which can be inconvenient for SMEs. While they are still viable options for bigger enterprises, they are not practical for businesses which operate in half or a quarter of the former’s usual office space. For small to medium-sized office spaces, the more practical storage choice would be mobile shelving. This option allows you to use at least 51 per cent more of your overall floor space because these shelves are designed to use significantly less space than their stationary counterparts. Mobile shelves offer you an efficient and space-saving solution for your filing needs. The shelving units for this type are equipped with a wheeled traction system that makes them easily moveable and adjustable with minimal effort. When the shelves are not in use, you can close them to make more use of the space usually allocated for aisles. With mobile shelving, you will be able to maximise your office space while improving work flow and presumably enhancing employee productivity. For over 25 years, we at Shelving Shop Group have dedicated ourselves to providing you with customised storage solutions that fit your exact needs. We have a team of experts that will help you throughout the whole process—from designing to manufacturing and installing the shelving systems of your choice. We have mobile shelving units that are highly versatile and flexible to accommodate your current and future storage needs. Our mobile shelves are designed to be slim but sturdy so you can store large volumes of material without having to worry about the load. Call us on 0800 180 280 for any enquiries about our shelving systems or fill in this form: https://www.shelvingshopgroup.co.nz/contact-us/ to book an appointment.